6Department of Applied Chemistry, Amity School of Applied Sciences, Amity University Uttar Pradesh, Lucknow Campus, Lucknow-226028, U.P, India. Lucknow Campus, Lucknow-226028, U.P, India. Herbal medicine; Curcuma longa; Ethanolic extract; Anti-asthamatic activity; Mast cell stabilisation. Herbalism or "herbal medicines” have a long history to cure several kinds of human diseases. Various parts of plants such as leaf, stem, bark, root, etc. have been used for preventing, allaying symptoms or reverting anomalies back to usual. Plants have been the basis for medical treatments through much of human history, and such traditional medicine is still widely practiced today. Modern medicine recognizes “herbal medicines” as a form of alternative medicine, as the practice of “herbal remedies” is not strictly based on evidence gathered using scientific methods. Many of the pharmaceuticals currently available to physicians have a long history of use as herbal remedies, including opium, aspirin, digitalis, and quinine. The World Health Organization (WHO) estimates that 80 percent of the population of some Asian and African countries presently uses herbal medicines for some aspect of their primary health care. The use of, and search for, drugs and dietary supplements derived from plants have accelerated in recent years. Pharmacologists, microbiologists, botanists, and natural-products chemists are combing the Earth for phyto-chemicals and leads that could be developed for treatment of various diseases. Among the 120 active compounds currently isolated from higher plants and widely used in modern medicine today, 80 percent show a positive correlation between their modern therapeutic use and the traditional use of the plants for which they were derived. More than two thirds of the world's plant species; at least 35,000 of which are estimated to have medicinal value come from the developing countries . Asthma is a chronic inflammatory disorder of the airways in which many cells and cell elements play a role and is characterized by chronic inflammation which is associated with airway hyper-responsiveness that leads to recurrent episodes of wheezing, breathlessness, chest tightness and coughing. Asthma is one of the most common chronic diseases in the world . It is estimated that around 334 million people in the world currently have asthma . Considerably higher estimates can be obtained with less conservative criteria for the diagnosis of clinical asthma. It was realized from various reports that Curcuma longa, a perennial herb, belonging to the family Zingiberaceae, has displayed a plethora of potential biological activities such as anti-inflammatory,  anti-oxidant,  anti-coagulant,  anti-fungal,  anti-diabetic,  anti-carcinogenic,  anti-microbial,  cardiovascular,  gastrointestinal,  anti-alzheimer,  anti-thrombotic,  anti-hyperlipidemic,  hepatoprotective activity,  anti-cancer,  anti-arthritis,  anti-venom  and anti-depressant  to enumerate a few from its various parts. Furthermore, this plant has also been used to cure various periodontal,  dental,  immunological,  gastrointestinal  and neurological ailments  and anomalies related to pregnancy and neonates  besides innumerable other utilities. It also finds application in the field of agriculture as pesticide,  fungicide, insecticide and repellent . Keeping in view the above mentioned medicinal importance of the plant, we became interested to investigate the plant for a possible cure for asthma, an inflammatory phenomena involving the respiratory system by evaluating certain bio-molecular parameters that play crucial role in inflammatory processes. In context with our on-going research towards drug discovery through design and synthesis of novel class of natural/semisynthetic/synthetic molecules we have investigated various structurally diverse biologically potent compounds . Our group has also been engaged on the biological evaluation of biologically potent extract of various plants  and keeping in view the multiple importance of this plant we became interested in exploring the antiasthmatic activity. Although, the anti-asthmatic of this plant has already been studied  specifically in case of Guinea pig. In the present paper, we would like to explore the anti-asthmatic activity of the methanolic extract of this plant specifically in rats, employing various crucial parameters involved in the pathogenesis of inflammation, the main etiological component of asthma. It was found that the methanolic extracts of the plant under investigation normalised the deviation in the evaluated parameters and the potency of the extracts increased considerably with increasing concentration. Curcuma longa, a perennial herb and member of Zingiberaceae family, is identified by its oblong, pointed leaves and bearing funnel-shaped yellow flowers growing up to three to five feet of height. This plant is cultivated in countries having tropical climate like India, China etc. Dried Curcuma longa is the source of spice turmeric, which is extensively used as dietary spice and pigment, in Ayurveda, Unani and Siddha system of medicine and in textile and pharmaceutical industries. This herb is pharmacologically safe, as it is consumed as a dietary herb. Figure 1. Pictures of entire plant, flowers, and rhizome of Curcuma longa. The plant material employed in this investigation is the dried finger rhizomes of Curcuma longa which was collected from the Coimbatore district of Tamil Nadu state of India and was authenticated from Botanical Survey of India, Southern Regional Centre, Lawley Road, Coimbatore, and Tamil Nadu. Fresh finger rhizomes were washed in running water, shade dried and crushed to fine powder. The extract was prepared using the standard procedure through defatting the powdered finger rhizomes using petroleum ether through soxhlet apparatus for 48 hours . The resulted marc was further extracted with methanol by Soxhlet apparatus for 72 hours. The extract was then filtered and evaporated to dryness in vacuum. The yield of methanolic extract was calculated and found to be 40%. The marc left behind was kept for further use. Healthy, adult Wistar rats of both sexes (180-220 g) were obtained from the Central animal house facility from J.S.S College of Pharmacy, Ootacamund, and Tamil Nadu. The animals were kept in a well-ventilated room and the animals had exposed to 12 hrs day and night cycle with a temperature between 20+/-3 degree Celsius. The animals were housed in large spacious, hygienic polypropylene cages during the course of the experimental period. The animals were fed with water and rat feed ad libitum, supplied by animal house facility of this institution. All the experiments were performed after obtaining prior approval from IAEC. The animals were housed in suitable environmental conditions with nutritional feed and filtered tap water ad libitum. Female wistar rats of weight (180-220 g) were taken for the study and kept for overnight fasting. Next day, body weight was taken and curcumin was administered orally at a dose of 2000 mg/kg in distilled water. Then the animals were observed for mortality and morbidity at 0, ½, 1, 2, 4, 6, 8, 12 and 24 hours. Feed was given to the animals after 4 hours of the dosing and the body weight was checked 6 hours after dosing. Morbidity like convulsions, tremors, grip strength and pupil dilatation were observed. The animals were observed twice daily for 14 days and body weight was taken. The same experiment was repeated once again on 3 rats (preferably female) as there was no observable clinical toxicity for the animals on the phase I study. OECD guidelines for testing of chemicals are periodically reviewed in light of scientific progress or changing assessment practices. It is carried out for determining the LD50 of various chemicals. The test procedure described in this guideline is of value in minimizing the number of animals required to estimate the accurate oral toxicity of chemicals and for this purpose four dose levels were selected and three female rats per group were taken for study. For the evaluation process animals were divided into various groups and categories and then they were subjected to various parameters. Animals were divided into five groups of 3 male and 3 female rats in each group. Group I: Control-I (Normal animal treated with solvent). Group II: Control-II (Sensitized control). Group IV: Curcumin (100 mg/kg). Group V: Curcumin (200 mg/kg). Similar groups were taken for both short term (i.e. 15 days) and long term (i.e. 60 days) studies. For sensitization the ovalbumin (OVA) suspension was prepared in the concentration of 2 mg/ml in phosphated buffered saline (PBS). This suspension was precipitated with aluminium hydroxide gel (AlOH3) 400 μg/ml, which was added as an adjuvant . For airway allergen challenge 1% w/v OVA suspension was prepared in phosphated buffered saline (PBS) and then the animals were sensitized by exposing to the aerosol of ovalbumin with the help of a commercially available spray. The procedure for sensitizing the animals was carried in a Perspex made histamine chamber . The animals (180-220 g) were sensitised intradermal with ovalbumin (OVA) precipitated with aluminium hydroxide gel in PBS on 0th day for both the short (15 day) and long (60) term study groups. The sensitisation procedure was followed by airway challenge on 1st, 3rd, 5th, and 7th day. A last airway challenge was performed 18 hours before sacrificing the animals for both the short (15 day) and long (60 day) term study groups. The standard and test drugs were administered for 15 days (i.e. short term study) and 60 days (i.e. long term study) by oral route. The drugs were administered to all the groups twice daily. The groups were given the treatments at 8.00 A.M. and 18.00 P.M. The Broncho alveolar lavage fluid (BALF) was collected and centrifuged at 170 g for 10 minutes. The pellets obtained after centrifugation were re-suspended in 0.5 ml of PBS and a thin smear was prepared on a slide. Then the smeared slide was air dried and then stained for ten minutes using Giemsa stain. The slide was then subjected to distilled water for the purpose of destaining. Counter staining was later carried out using May Grunwald stain. The differential count was carried out using a digital light microscope (Motic, Japan, Cat. No.B-1 series) at 100× magnification by oil immersion technique . The Broncho alveolar lavage fluid (BALF) supernatant was collected and incubated for 30 minutes at 37 degree with HEPES buffer 0.01 ml, FAD 10 μl, NADPH 0.001 ml and 290 μl of distilled water. Any unreacted NADPH in the solution was oxidized by incubating the solution with potassium ferricyanide (1 mM) at 25°C for 10 min for the conversion of nitrate to nitrite .Further the sample was incubated with 1 ml of Griess reagent for 10 min and absorbance was measured at 543 nm using UV spectrophotometer perkinemler, (model No Lambda 25). A standard curve was plotted with absorbance 543 nm versus concentration μM of sodium nitrite and was used to determine the nitric oxide concentration in BALF samples . The frozen lung tissue sample (200 mg) was obtained, minced and homogenized with 1-2 ml of Phosphate buffer solution (PBS) 50 mM, 6.0 pH containing 0.5% hexadecyl trimethyl ammonium bromide (HTAB) before sonication in an ice bath for ten seconds. After homogenization the specimens were freeze thawed three times and sonication was repeated. Suspensions were then centrifuged at 40,000 X g for 15 minutes and the resulting supernate or pellet was assayed. 0.1 ml of the sample or pellet was mixed with 2.9 ml of 50 mM phosphate buffer, PH-6.0, containing 0.167 mg/ml of o-dianisidinedihydrochloride and 0.0005 % of hydrogen peroxide. Immediately the absorbance was measured at 460 nm using shimatzu spectrophotometer . Estimation of protein was done by Lowry’s method, which requires 4 different solutions namely: solution A, solution B, solution C, and solution D. Solution A is the mixture of sodium carbonate (2%), sodium tartarate (0.05%), and sodium hydroxide (4%). Solution B contains freshly prepared copper sulphate solution (1%). Solution C contains 9 parts of solution A mixed with 1 part of solution B and solution D contains the Folins-Ciocalteaus reagent . Step I: 0.2, 0.4, 0.6, 0.8 ml of the supernatant was pipetted out and 1 ml of the working standard was added into a series of test tubes. Step II: 0.1 ml and 0.2 ml of the sample extract was pipetted out into two other test tubes. Step III: The volume was made up to 1 ml in all the test tubes with double distilled water and a tube with 1 ml of water was served as the blank. Step IV: 5 ml of reagent C was then added to each tube including the blank. They were then mixed well and allowed to stand for 10 minutes. Step V: 0.5 ml of reagent D was then added, mixed well and incubated at room temperature in dark for 30 minutes. Blue colour was developed. Step VI: Readings were taken at 660 nm. Step VII: A standard graph was plotted and the amount of protein in the sample was calculated. The standard graph was drawn by plotting concentration values on X axis and optical density values on Y axis. Amount of protein was expressed as μg/gm or 100 gm/sample. An incubation mixture was prepared as shown in the following table (Table 1). Table 1. The incubation mixture constituents for estimation of malonyl dialdehyde. The incubation mixture was made up to 5.0 ml with double distilled water and then heated in boiling water bath for 30 minutes. After cooling, the rate chromogen was extracted into 5 ml of a mixture of n-butanol and pyridine (15:1 v/v), centrifuged at 4000 rpm for 10 minutes.The organic layers was then separated and its absorbance was measured at 532 nm. 1,1,3,3-tetra ethoxypropane (TEP) was used as an external standard and the level of lipid peroxides was expressed in nmoles of lipid peroxidation units/mg tissue. The calibration curve for TEP was prepared by the above described procedure taking TEP as standard. Linearity was obtained over the range of 80-240 nmoles of TEP. The overnight fasted animals were sacrificed with excess dose of ether anaesthesia. The abdomen was cut open to expose the intestine. Pieces of mesentery with connecting lobes of fat and blood vessels were rapidly dissected out and small pieces of the mesentery were cut and placed in a beaker containing Ringer Locke (in mM: NaCl 154, KCl 5.6, CaCl2 2.2, NaHCO3 6.0 and dextrose 5.5) solution for 30 ± 1 min. This solution contained curcumin in the physiological solution (Ringer Locke). Later, the tissues were exposed to C 48/80 (0.8 μg/ml) and then the tissues were incubated for further 30 ± 1 min. The pieces of mesentery were removed and placed in a clean slide. Excess fatty layers and adhering small intestinal tissues were removed. The trimmed tissues were dipped in 4% formaldehyde solution containing 0.1 % O-toludine blue for 20-30 min and then the tissues were dipped in acetone and then in xylene (2 changes each) for 5 ± 1 min. six pieces of mesentery were used for each concentration of the test substance. The stained mesentery pieces were focused through a digital light microscope (M/s. Motic, Japan) at 100× magnification and 100 mast cells were counted, starting from the left hand side of the field and then proceeding clockwise. The number of intact and fragmented or disrupted mast cells was noted. A mast cell was considered disrupted if 4 or 5 granules were found around the mast cell. The percentage of mast cell fragmented or disrupted and the percentage of intact mast cells were tabulated. 1. An aliquot of serum sample was suspended in 1 ml of 1× equilibration buffer and spun if the solution was not clear. 2. The procedure was started by opening the top cap and then the bottom cap of the protein Agarose column. 3. The protein Agarose column was then equilibrated with 5 ml of 1× equilibration buffer and then the buffer was allowed to drain out completely. 4. 0.01 ml of serum sample was saved for analyzing later on sodium decyl sulphate polyacrylamide gel electrophoresis (SDA PAGE). 5. The remaining 990 μl of serum solution was then loaded onto the column and allowed to drain off completely. 6. The column was then washed with 1× equilibration buffer till absorbance at 280 nm was found to be less than 0.03. 7. The bound IgG was then eluded by using 1× elution buffer. Five test tubes were then taken and 25 μl of neutralizing buffer was added to each tube. 1 ml fraction was then collected into each tube and absorbance was read at 280 nm and the readings were noted. The fractions were then pooled with absorbance more than 0.3. 8. Immediately after elution the column was washed with 5 ml of 1× storage buffer and stored at 40C. 1. The absorbance of the pooled fractions were checked at 280 nm against water, taken as blank. Absorbance at 280 nm/1.4=X mg/ml of protein (IgG). Where extinction coefficient of IgG is 1.4 (i.e. when the absorbance at 280 nm is 1.4, the concentration of IgG solution is X mg/ml). At the end of 15th and 60th day, animals of respective groups were sacrificed with excess dose of ether. Blood was collected by cardiac puncture. Collected blood was then centrifuged at 1200 rpm for 10 minutes and plasma was separated out. 2 ml of the separated plasma was taken in a glass tube and volume was made upto 3 ml with millipore water and pH was measured with a pH-meter . The collected data were subjected to appropriate statistical test like one-way ANOVA (Analysis of Variance) followed by an appropriate post hoc analysis such as dunnet’s multiple comparison tests. P values of less than 0.01 were considered significant. The analysis was carried out using Graph Pad Instat software of version 3. The pharmacological studies which we carried on curcumin had showed a significant anti-asthmatic activity. Since, the effectiveness of curcumin has been utilized among ethnic population, especially for anti-cough or as an expectorant. So, based on these facts; we have planned for carrying a pharmacological evaluation for anti-asthmatic activity of curcumin. In Indian system of medicine Curcuma longa (Turmeric) has been used for various types of ailments like rheumatism, inflammatory disorders, bronchial congestion, immune suppression and even for HIV like diseases. But, the pharmacological and scientific evidence for its anti-asthmatic activity is not yet proved at molecular level. Based on the above factors we have conducted the anti-asthmatic activity of curcumin by using ovalbumin (OVA) sensitized Wistar rat models. The estimation of total WBC count revealed that the OVA induction drastically elevated the neutrophil count as well as the level of eosinophils. The treatment with curcumin reduced or normalized the elevated levels of WBC fractions. The difference between 15 day and 60 day study was not much varied among the treatment groups. These findings suggested that curcumin may be having an anti-inflammatory, immuno-modulatory or may be effective in reducing the specific pathways of inflammation, which can lead to elevated WBC count . Nitrate is an important physiologic messenger, as a by-product of tissue oxidation. Nitrate is derived from the metabolism of L-arginine and L-citrilline . Nitric oxide is an important signalling effect or molecule in tissue inflammation and immunity. This, in turn induce the production of prostaglandins, endoperoxide synthase from monocytes and macrophages resulting in increased synthesis of prostaglandin; established mediators of lung inflammation . Our findings suggested that the production of nitrate was significantly reduced by curcumin at single and double doses. This could be evidenced by the reduction in lung inflammation in animals. It is proposed that the level of MPO will increase with elevated number of neutrophils and consequent increase in inflammatory response. With respect to this fact we have estimated the level of myeloperoxidase and it was found to be elevated among the untreated groups. The treatment with significantly lowered the MPO level. This report further supports the MPO lowering effects of curcumin for neutrophil content. This suggests that curcumin-I and curcumin-II can be used as complementary medicine in the treatment of asthma. In the estimation of differential WBC counting, the following values were observed. For control II (sensitized control) animals, the total WBC count was found to be 7100.32 ± 0.23 cells/mm3. The normal animal, which received only the saline showed the value of 3100.21 ± 0.03 cells/mm3 (P<0.01). The animals treated with Ketotifen and Beclomethasone showed the value of 3980.56 ± 0.07 cells/mm3 (P<0.01), whereas the animals treated with Curcumin-I and Curcumin-II showed the values of 4701.12 ± 0.02 cells/mm3 (P<0.01) and 4332.45 ± 0.21 cells/mm3 (P<0.01) respectively. The above values showed that the treatment with Curcumin-I and Curcumin-II significantly reduced WBC count as compared to that of control II (sensitized control). The broncho-alveolar lavage fluid (BALF) nitrate level in the control II group (sensitized control) was found to be 293.66 ± 2.21. The normal animal, which received only the solvent, had the value of 72.38 ± 1.44 (p<0.01). The animals treated with Ketotifen and Beclomethasone showed the value of 116.50 ± 3.95 (P<0.01) whereas animals treated with Curcumin-I and Curcumin-II at a dose of 100 and 200 mg/kg showed the value of 280.52 ± 1.55 (p<0.05) and 135.65 ± 5.27 (P<0.01) respectively. The above values showed that Curcumin-II treatment normalized the elevated nitrate level in experimental rats far more effectively than Curcumin-I treatment. The tissue (MPO) myeloperoxidase level in the control II group (sensitized control) was found to be 19.2 ± 1.02. The normal animal, which received only the solvent, had the value of 8.1 ± 0.34 (p<0.01). The animals treated with Ketotifen and Beclomethasone showed the value of 9.8 ± 1.58 (P<0.01) whereas animals treated with treatment I (Curcumin-I) and treatment II (Curcumin-II) at a dose of 100 and 200 mg/kg showed the value of 11.3 ± 0.33 (P<0.01) and 10.7 ± 0.13 (P<0.01) respectively. The above values showed that Curcumin-I and Curcumin-II treatment normalizes the increased tissue MPO level in experimental rats. The total tissue protein in the control II group (sensitized control) was found to be 69.58 ± 2.30. The normal animals, which received only the solvent, had the value of 95.54 ± 1.27 (p<0.01). The animals treated with Ketotifen and Beclomethasone showed the value of 88.99 ± 1.68 (P<0.01) whereas animals treated with Curcumin-I and Curcumin-II at a dose of 100 and 200 mg/kg had showed the value of 77.12 ± 1.13 (p<0.05) and 85.11 ± 1.70 (P<0.01) respectively. The above values showed that Curcumin- II treatment was more effective than Curcumin-I treatment in normalizing the depleted total protein level in experimental rats. The tissue malonyldialdehyde (MDA) level in the control II group (sensitized control) was found to be 36.27 ± 1.06. The normal animal, which received only the solvent, had the value of 18.22 ± 0.70 (p<0.01). The animals treated with Ketotifen and Beclomethasone showed the value of 22.98 ± 1.10 (P<0.01) whereas animals treated with Curcumin-I and Curcumin-II at a dose of 100 and 200 mg/kg showed the value of 32.15 ± 0.64(p<0.05) and 25.60 ± 1.05 (P<0.01) respectively. The above values showed that Curcumin-II treatment was more effective than Curcumin-I treatment in normalizing the increased tissue MDA level in experimental rats. The percentage of intact mast cells in the control II group (sensitized control) was found to be 13.2 ± 2.5 percent. The normal animal, which received only the solvent, had 84.1 ± 2.3 (p<0.01) percent of intact mast cells. The animals treated with Ketotifen and Beclomethasone showed 76.4 ± 3.4 (P<0.01) percent of intact cells whereas animals treated with treatment I (Curcumin-I) and treatment II (Curcumin-II) at a dose of 100 and 200 mg/kg showed 39.8 ± 2.1 (p<0.05) and 68.2 ± 0.7 (P<0.01) percent of intact cells respectively. The above values showed that Curcumin-II treatment was more effective in increasing the percent of intact cells as compared to Curcumin-I treatment in experimental rats. The serum IgG level in the control II group (sensitized control) was found to be 6.98 ± 0.50. The normal animal, which received only the solvent, had the value of 2.89 ± 0.01 (p<0.01). The animals treated with Ketotifen and Beclomethasone showed the value of 2.98 ± 0.02 (P<0.01) whereas animals treated with Curcumin-I and Curcumin-II at a dose of 100 and 200 mg/kg showed the value of 3.36 ± 0.16 (p<0.01) and 3.05 ± 0.22 (P<0.01) respectively. The above values showed that Curcumin-I and Curcumin-II treatment normalizes the increased serum IgG level in experimental rats. The blood pH in the control II group (sensitized control) was found to be 6.98 ± 0.10. The normal animal, which received only the solvent, had the value of 7.45 ± 0.02 (p<0.01). The animals treated with Ketotifen and Beclomethasone showed the value of 7.40 ± 0.03 (P<0.01) whereas animals treated with Curcumin-I and Curcumin-II at a dose of 100 and 200 mg/kg showed the value of 7.21 ± 0.06 (P<0.05) and 7.35 ± 0.02 (P<0.01) respectively. The above values showed that Curcumin-II treatment was more effective than Curcumin-I treatment in normalizing the acidic blood pH level in experimental rats (Table 2). Table 2. Curcumin-I and II treatments in normalizing the acidic blood pH level in experimental rats. In the estimation of differential WBC counting, the following values were observed. For control II (sensitized control) animals, the total WBC count was found to be 8321.34 ± 0.26 cells/mm3. The normal animal, which received only saline showed the value of 3156.14 ± 0.14 cells/mm3 (P<0.01). The animals treated with Ketotifen and Beclomethasone showed the value of 3503.04 ± 0.06 cells/mm3 (P<0.01), whereas the animals treated with Curcumin-I and Curcumin-II showed the values of 4267.43 ± 0.72 cells/mm3 (P<0.01) and 4020.63 ± 0.11 cells/mm3 (P<0.01) respectively. The above values showed that the treatment with Curcumin-I and Curcumin-II significantly reduced WBC count as compared to that of control II (sensitized control). The broncho-alveolar lavage fluid (BALF) nitrate level in the control II group (sensitized control) was found to be 303.66 ± 1.87. The normal animal, which received only the solvent, had the value of 72.48 ± 1.38 (p<0.01). The animals treated with Ketotifen and Beclomethasone showed the value of 93.96 ± 3.81 (P<0.01) whereas animals treated with Curcumin-I and Curcumin-II at a dose of 100 and 200 mg/kg showed the value of 148.64 ± 4.80 (p<0.01) and 109.38 ± 3.74 (P<0.01) respectively. The above values showed that both Curcumin-I and Curcumin-II treatments normalized the increased nitrate level in experimental rats effectively. The tissue (MPO) myeloperoxidase level in the control II group (sensitized control) was found to be 22.6 ± 0.68. The normal animal, which received only the solvent, had the value of 8.4 ± 0.33 (p<0.01). The animals treated with Ketotifen and Beclomethasone showed the value of 9.8 ± 0.21 (P<0.01) whereas animals treated with treatment I (Curcumin-I) and treatment II (Curcumin-II) at a dose of 100 and 200 mg/kg showed the value of 12.9 ± 0.11 (p<0.01) and 10.3 ± 0.19 (P<0.01) respectively. The above values showed that both Curcumin-I and Curcumin-II treatments normalized the increased tissue MPO level in experimental rats effectively. The total tissue protein in the control II group (sensitized control) was found to be 70.29 ± 0.94. The normal animal, which received only the solvent, had the value of 95.19 ± 1.42 (p<0.01). The animals treated with Ketotifen and Beclomethasone showed the value of 91.49 ± 1.02 (P<0.01) whereas animals treated with Curcumin-I and Curcumin-II at a dose of 100 and 200 mg/kg showed the value of 82.89. ± 2.36 (p<0.01) and 85.27 ± 1.69 (P<0.01) respectively. The above values showed that both Curcumin-I and Curcumin treatments normalized the depleted total protein level in experimental rats effectively. The tissue MDA level in the control II group (sensitized control) was found to be 39.25 ± 0.95. The normal animal, which received only the solvent, had the value of 18.28 ± 0.79 (P<0.01). The animals treated with Ketotifen and Beclomethasone showed the value of 20.30 ± 0.65 (P<0.01) whereas animals treated with treatment I (Curcumin-I) and treatment II (Curcumin-II) at a dose of 100 and 200 mg/kg showed the value of 24.38 ± 1.04 (P<0.01) and 21.60 ± 1.21(P<0.01) respectively. The above values showed that both Curcumin-I and Curcumin-II treatments normalized the increased tissue MDA level in experimental rats effectively. The percentage of intact mast cells in the control II group (sensitized control) was found to be 13.5 ± 2.3 percent. The normal animal, which received only the solvent, had value of 81.2 ± 0.7 (p<0.01) percent of intact mast cells. The animals treated with Ketotifen and Beclomethasone showed 78.2 ± 2.1 (P<0.01) percentof intact mast cells whereas animals treated with treatment I (Curcumin-I) and treatment II (Curcumin-II) at a dose of 100 and 200 mg/kg showed 45.3 ± 0.7 (p<0.01) and 73.1 ± 3.2 (P<0.01) percent of intact mast cells respectively. The above values showed that Curcumin-I and Curcumin-II treatment increases the percent of intact cells in experimental rats. The serum IgG level in the control II group (sensitized control) was found to be 7.21 ± 0.15. The normal animal, which received only the solvent, had the value of 3.23 ± 1.04 (p<0.01). The animals treated with Ketotifen and Beclomethasone showed the value of 3.57 ± 0.01 (P<0.01) whereas animals treated with Curcumin-I and Curcumin-II at a dose of 100 and 200 mg/kg showed the value of 4.01 ± 0.76 (p<0.01) and 3.79 ± 0.28 (P<0.01) respectively. The above values showed that both Curcumin-I and Curcumin-II treatments normalized the increased serum IgG level in experimental rats effectively. The blood pH in the control II group (sensitized control) was found to be 6.87 ± 0.17. The normal animal, which received only the solvent, had the value of 7.45 ± 0.02 (P<0.01). The animals treated with Ketotifen and Beclomethasone showed the value of 7.43 ± 0.03 (P<0.01) whereas animals treated with Curcumin-I and Curcumin-II at a dose of 100 and 200 mg/kg showed the value of 7.38 ± 0.03 (p<0.01) and 7.41 ± 0.04 (P<0.01) respectively. 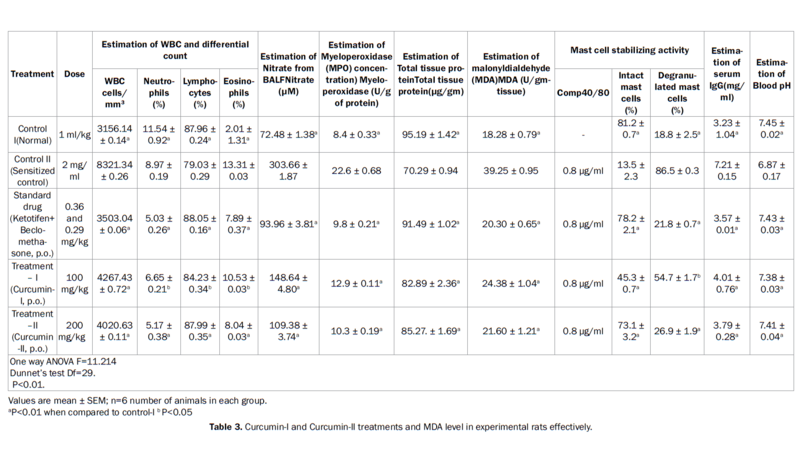 The above values showed that both Curcumin-I and Curcumin-II treatments normalized the increased tissue MDA level in experimental rats effectively (Table 3). Table 3. Curcumin-I and Curcumin-II treatments and MDA level in experimental rats effectively. On histopathological assessment of lung and trachea of sacrificed animals of both short term (15 day) and long term (60 day) we observed that the control-I (Normal, saline treated), Figure 2a and 2b group animals showed no histo-morphological changes but the control-II (Sensitized control), Figure 3a and 3b group animals showed peri-bronchial inflammation, congestion in the alveoli due to the formation of lymphoid aggregates and intra-luminal hemorrhage in the bronchus. The standard group animals, Figure 4a and 4b showed the most resembling histomorphology to the normal. While curcumin-I (100 mg/kg), Figure 5a and 5b and curcumin-II (200 mg/kg), Figure 6a and 6b groups showed less abnormality of histomorphological changes. Figure 2. (a) Rat lung (Control-I) (b) Rat trachea (Control-I). Figure 3. 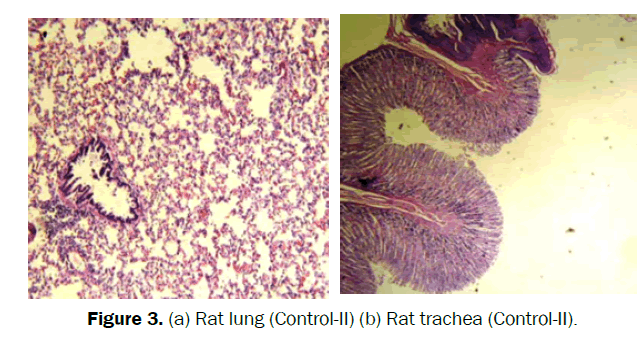 (a) Rat lung (Control-II) (b) Rat trachea (Control-II). Figure 4. 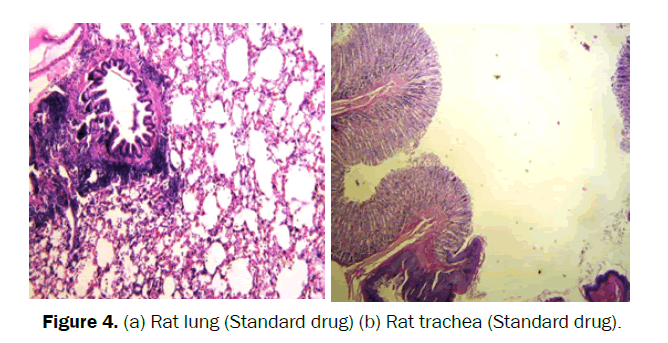 (a) Rat lung (Standard drug) (b) Rat trachea (Standard drug). Figure 5. 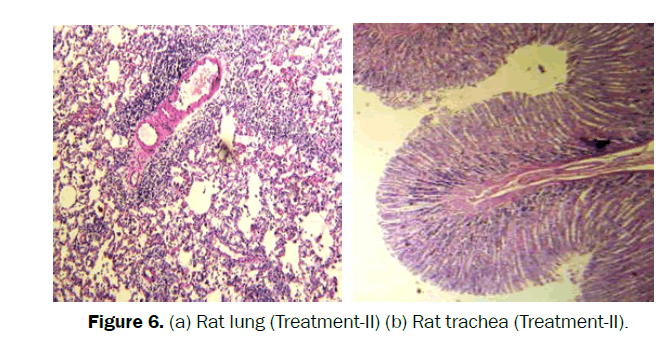 (a) Rat lung (Treatment-I) (b) Rat trachea (Treatment-I). Figure 6. 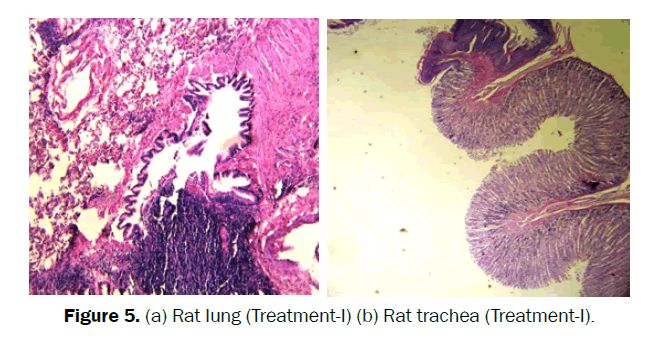 (a) Rat lung (Treatment-II) (b) Rat trachea (Treatment-II). The various types of studies carried out at molecular level revealed that, the natural compound, curcumin may possess antiasthmatic activity. From the changes brought about by the administration of ovalbumin (OVA), in the levels of various bio-molecular parameters accessed in induced asthma model in rats it is apparent that the OVA induced asthma model in rats is homologous with clinical asthma. As curcumin treatment was able to either revert back or ameliorate the changes in the levels of the biomolecular parameters investigated back to normal, it can be emphasized that curcumin may possess anti-asthmatic activity and may be a strong contender in the arena of herbal remedies for the “cure” of asthma . It is also blatantly clear from the observations made, that curcumin-II (200 mg/kg) treatment was able to regress the alterations in the levels of the explored bio-molecular factors more efficiently than the curcumin-I (100 mg/kg) treatment. So, it can also be concluded that the effectiveness of curcumin in reverting the jeopardized situation in asthma corresponds with the dose of curcumin. But the exact molecular mechanism by which curcumin reduces the levels of malonyldialdehyde (MDA) and myeloperoxidase (MPO) is still not resolved. So, it needs further pharmacological investigation and clinical trialing of curcumin in order to cultivate a potential restorative agent for the treatment of clinical asthma. The corresponding author wish to thank Pro-Vice Chancellor and Dean, Research (Science and Technology), Amity University Uttar Pradesh (AUUP), Lucknow Campus, Lucknow, for his constant encouragement and support for research. The authors confirm that there is no conflict of interest with the commercial identities used inside the manuscript. Barnes J, Anderson LA, Phillipson JD. Herbal Medicine, 2008. Hoppenot D, Malakauskas K, Lavinskiene S, Bajoriuniene I, Kalinauskaite V, Sakalauskas R. Peripheral blood Th9 cells and eosinophil apoptosis in asthma patients. Medicina. 2015-51:10-17. Martinez FD. Genes, environments, development and asthma: a reappraisal. EurResp J. 2007;29:179–184. Srivastava R. Inhibition of neutrophil response by curcumin. Agents Actions, 1989,28:298-303; (b) Labban L. Medicinal and pharmacological properties of Turmeric (Curcumalonga): A review. Int J Pharm Biomed Sci. 2014;5:17-23. Toda S, Miyase T, Arich H Natural antioxidants. Antioxidative compounds isolated from rhizome of Curcuma longa L. ChemPharmacol Bull, 1985, 33:1725-1728;(b) Mortellini R, Foresti R, Bassi R, Green CJ. Curcumin, an antioxidant and anti-inflammatory agent, induces heme oxygenase-1 and protects endothelial cells against oxidative stress. Free RadicBiol Med.2000, 28:1303-1312. Kumar A, Dora J, Singh A. A review on spice of life Curcuma longa (turmeric) Int J Applied Biochem& Pharm Tech. 2010, 2:372-379. Apisariyakul A, Vanittanakom N, Buddhasukh D. Antifungal activity of turmeric oil extracted from Curcuma longa (Zingiberaceae). J Ethnopharmacol. 1995;49:163-169. Wickenberg J, Ingemansson SL, Hlebowicz J. Effects of Curcuma longa (turmeric) on postprandial plasma glucose and insulin in healthy subjects. Nutr J. 2010;9:43; (b) Zhang DW, Fu M, Gao SH, Liu JL. Curcumin and diabetes: A systematic review. Evidence-Based Comp. & Alt. Med. 2013;2013:1-16. Dorai T, Cao YC, Dorai B. Therapeutic potential of curcumin in human prostate cancer. III. Curcumin inhibits proliferation, induces apoptosis, and inhibits angiogenesis of LNCaP prostate cancer cells in-vivo. Prostate. 2001;47:293-303. Rasmussen HB, Christensen SB, Kvist LP, Karazami A. A simple and efficient separation of the curcumins, the antiprotozoal constituents of Curcuma longa. Planta Med. 2000;66:396-398. Ramirez-Tortosa MC, Mesa MD, Aguilera MC. Oral administration of a turmeric extract inhibits LDL oxidation and has hypocholesterolemic effects in rabbits with experimental atherosclerosis. Atherosclerosis. 1999;147:371-378. Ammon HPT, Wahl MAPharmacology of Curcuma longa. PlantaMedica. 1991;57:1-7. (b) Rafatulla S, Tariq M, Alyahya MA Evaluation of turmeric (Curcuma longa) for gastric and duodenal antiulcer activity in rats. J Ethnopharmacol.1990;29:25-34. Ringman JM, Frautschy S, Cole GM, Masterman DL, Cummings JL.Apotential role of the curry spice curcumin in alzheimer’s disease. CurrAlzheimer Res.2005; 2:131-6. Srivastava R, Dikshit M, Srimal RC, Dhawan BN. Antithrombotic effect of curcumin. Thromb Res. 1985;40:413-417. Ramirez-Tortosa MC, Mesa MD, Aguilera MC. Oral administration of a turmeric extract inhibits LDL oxidation and has hypocholesterolemic effects in rabbits with experimental atherosclerosis. Atherosclerosis. 1999;147: 371-378. Park EJ, Jeon CH, Ko, G. Protective effect of curcumin in rat liver injury induced by carbon tetrachloride. J Pharm Pharmacol. 2010;52:437-440. Reddy BS, Rao CV. Novel approaches for colon cancer prevention by cyclooxygenase-2 inhibitors. J Environ PatholToxicolOncol. 2002;21: 155-164; (b) Ramachandran C, Fonseca HB, Jhabvala P. Curcumin inhibits telomerase activity through humantelomerase reverse transcritpase in MCF-7 breast cancer cell line. Cancer Lett. 2002;184:1-6. (c) Hour TC, Chen J, Huang CY. Curcumin enhances cytotoxicity of chemotherapeutic agents in prostate cancer cells by inducing p21(WAF1/CIP1) and C/EBPbeta expressions and suppressing NF-kappa-B activation. Prostate.2002;51:211-218. Belcaro G, Cesarone MR, Dugall M, Pellegrini L, Ledda A, etal. Efficacy and safety of Meriva, a curcumin-phosphatidylcholine complex, during extended administration in osteoarthritis patients. Altern Med Rev. 2010;15:337-44. Reddy SY. Studies on chemistry and biological activities of Curcuma longa linn - A review. Int J Adv Pharm Res. 2011;2:26-36. Xia X, Cheng G, Pan Y, Xia ZH, Kong LD. Behavioral, neurochemical and neuroendocrine effects of the ethanolic extract from Curcuma longa L. in the mouse forced swimming test. JEthnopharmacol.2007;110:356-63. Sambhav J, Rohit R, Raj UA, Garima M. Curcuma longa in the management of inflammatory diseases – a review. IntAyurvedic Med J. 2014;2:33-40. (b) Xu Y, Ku B, Tie L, Yao H, Jiang W, Ma X. Curcumin reverses the effects of chronic stress on behaviour, the HPA axis, BDNF expression and phosphorylation of CREB. Brain Res. 2006;1122:56-64. Nandini N. Comparative evaluation of 1% curcumin solution and 0.2% chlorhexidine irrigation as an adjunct to scaling and root planing in management of chronic periodontitis: A clinico-microbiological study. JPBMS.2012;14:1-7. Akram M, Shahab-uddin, Ahmed A, Usmanghani K. Curcuma longa and curcumin: a review article. Rom J Biol – Plant Biol. 2010;55:65–70. Prucksunand C, Indrasukhsri B, Leethochawalit M, Hungspreugs K. Phase II clinical trial on effect of the long turmeric (Curcuma longa Linn) on healing of peptic ulcer. Southeast Asian J Trop Med Public Health. 2001;32:208-215. 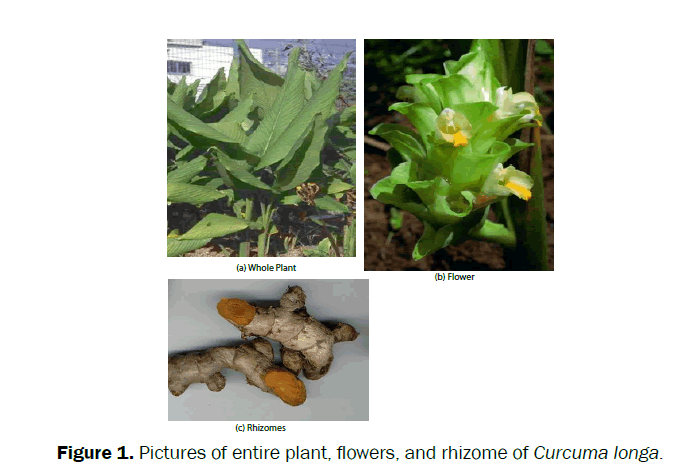 Kulkarni SK, Dhir A.An overview of curcumin in neurological disorders. Indian J Pharm Sci. 2010;72: 149-54. Singh S, Aggarwal, BB. Activation of transcription factor NF-kB is suppressed by curcumin (diferuloylmethane). J Biol Chem.1995;270:24995-5000. Dubey NK, Shukla R, Kumar A, Singh P, Prakash B.Prospects of botanical pesticides in sustainable agriculture. Curr Sci.2010;98:479-480. Christos A, Damalas.Potential uses of turmeric (Curcuma longa) products as alternative means of pest management in crop production. Plant Omics J. 2011;4:136-141. Chaturvedi D, Ray S, Srivastava AK, Chander R. ω-(2-Naphthyloxy) aminoalkanes as a novel class of anti-hyperglycemic and lipid lowering agents. Bioorg Med Chem, 2008, 16:2489-2498. Chaturvedi D, Dwivedi PK, Chaturvedi AK, Mishra N, Siddiqui HH, Mishra V.Semisynthetic hybrids of boswellic acids: A novel class of potential anti-inflammatory and anti-arthritic agents. Med Chem Res. 2015;24:2799-2812;(b) Negi AS, Chaturvedi D, Gupta A, Ray S, Dwivedi A, Singh MM. Amide derivatives of 9,11-seco-estra-1,3,5(10)-trien-11-oic acid as modified orally active estrogen agonists with moderate antagonistic activity. Bioorg Med ChemLett, 2005, 15:99-102. Ram A, Das M, Ghosh D. Curcumin attenuates allergen induced airway hyperresponsiveness in sensitised guinea pigs. Biol Pharm Bull. 2003;26: 1021-1024. Dash P, Mishra A, Chaturvedi AK, Chaturvedi D. Search for a herbal medicine: Anti-ulcer activity of methanolic extract of Haldinacordifolia. Res Rev: J PharmacognosyPhytochem.2014;2:19-23;(b) Dash PP, Chaturvedi AK, Mishra A, Chaturvedi D. (2014). Search for an herbal medicine: Antibacterial activity of methanolic extract of Haldinacordifolia. Int J Nat Prod Res, 2014, 4:95-99. Hussein HK, Abu-zinadah OA. Antioxidant effect of curcumin extracts in induced diabetic wister rats.Int J Zool Res. 2010;6:266-276. Thompson AB, Teschler H, Wang YM, Konietzko N, Costabel U. Preparation of bronchoalveolar lavage fluid with microscope slide smears. EurRespir J. 1996;9:603-608. Ravindranath V, Chandrasekhara N. Absorption and tissue distribution of curcumin in rats. Toxicol. 1980;16:259-265. Siegle JS, Hansbro N, Herbert C, Yang M, Foster PS, Kumar RK. Airway hyper-reactivity in exacerbation of chronic asthma is independent of eosinophilic inflammation. Am J Respir Cell Mol Biol.2006;35:565–570. Landgraf RG, Russo M, Jancar S. Acute inhibition of inducible nitric oxide synthase but not its absence asthma likeresponse. Eur J Pharmacol. 2005;518:212-220. Rossoni G, Manfredi B, Gennaro C, Bernareggi M, Ferruccio B. The nitro-derivative of aspirin, NCX 4016, reduces infarct size caused by myocardial ischemia reperfusion in the anesthetized rat. J PharmacolExp Therap. 2001;297:380-87. Lowry OH, Rosebrough NJ, Farr AL, Randall RJ. Total protein estimation by Lowry’s method. J Biol Chem. 1951;193:265-66. Aruoma OI, Halliwell B, Laughton MJ, Quinlan GJ, Gutteridge JC. The mechanism of initiation of lipid peroxidation: Evidence against a requirement for an iron (II), iron (III) complex. Biochem J. 1989;258:617-20. Gopumadhavan S, Rafiq M, Venkataranganna V, Mitra SK. Study of Antihistaminic and anti-anaphylactic activity of HK 07, a herbal formulation. Indian J Pharmacol. 2005;37:300-303. Zhang S, Leske DA, Lanier WL, Berkowitz A, Holmes JM. Preretinal neovascularization associated with acetazol amide-induced systemic acidosis in the neonatal Rat. Invest Opth and Vis Sci. 2001;42:1066-72. Hylkema MN, Hoekstra MO, Luinge M, Timens W. The strength of the OVA-induced airway inflammation in rats is strain dependent. Clinexpimmunol.2002;129:390-96. Macmiking J, Xi Q, Nathan C. Nitric oxide and macrophage function. Annu Rev Immunol. 1997;15:323-350. Landano LM, Crewes BC, Timmons MD, Morrow JD, Marnelt LJ. Peroxy nitrate, the coupling product of nitric oxide and super oxide, activates prostaglandin biosynthesis. Proc Nat Acad Sci. 1996;93:15069-74.